As a vegan, from day one I have been extremely careful not to buy or eat any animal-derived products (food or otherwise) for my family. 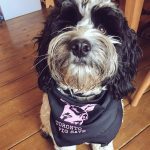 At first, as I got my head around new shopping habits, I was happy to survey my shopping trolley bursting with fruits, veg and other plant-based whole-food goodness – that was until I was in the pet aisle gingerly buying meat for the dog. I felt awful buying cans of animal body parts, but I carried on for some time, wishing there was another way. 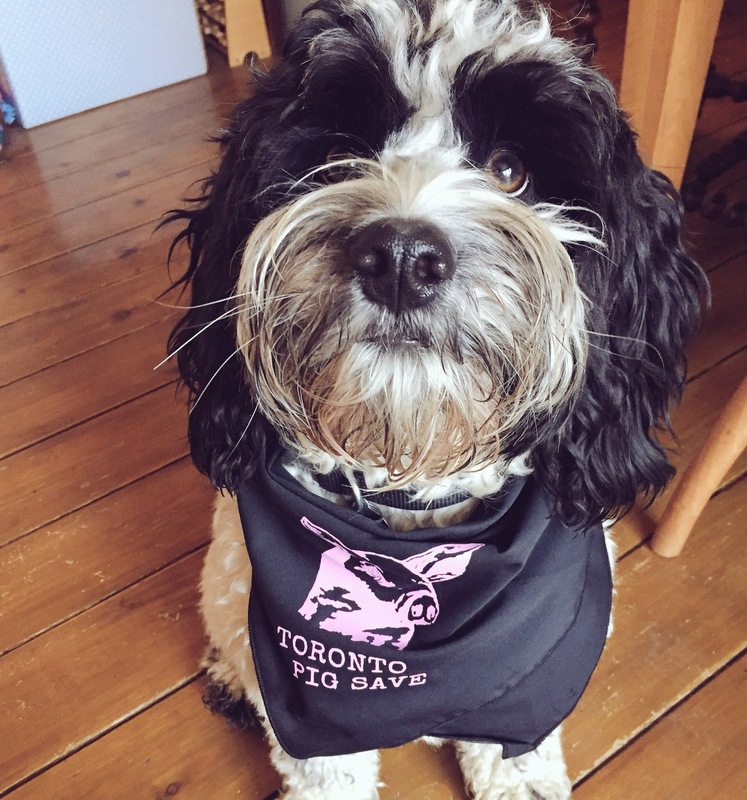 I didn’t want to support the meat – or dairy – industry in anyway with my money, but I had a responsibility to look after our family dog. The most ethical and widely available dog food I could find at the time was a brand aproved by Peta as not being tested on lab animals – see link. I still felt pretty torn, knowing what I knew about how the animals were treated before they ended up as dog food, especially exhausted and traumatised dairy cows. 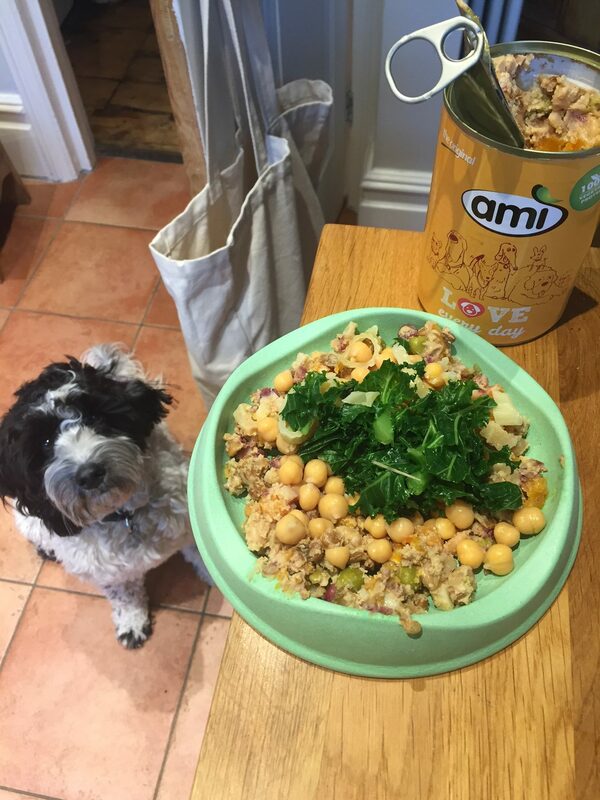 Do all dogs really need meat as part of a healthy diet? I decided to look into it and was very surprised at what I found. Much like many omnivores’ reaction to me having a vegan child, I was equally perplexed at the thought of a plant-based dog: can it be done? Is it healthy? What was the motivation – my conscience at the cost of her wellbeing? Why should so many animals suffer so greatly just so I can feed one other? Lots of questions were raised. The more I battled with my feelings of buying meat versus what I thought was best for the dog and the many (very heated on both sides) opinions on the matter online, the more I started to swap things like meat-based treats with chopped up-carrots, chickpeas and nut butters – all loved by our dog and better and healthier training-treat options than shop-bought meat ones full of additives and low-grade meat. I knew I could at least reduce her meat consumption to what I thought was essential, while working it all out. 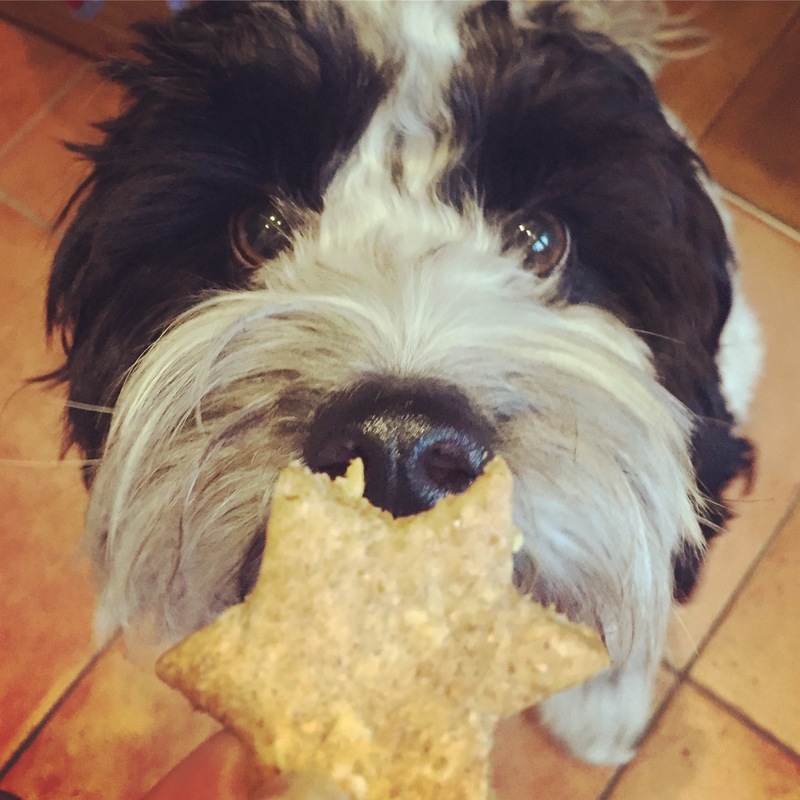 I also started baking my own dog biscuits (recipes here and here) and found Yarrah organic bone biscuits with added minerals – again she responded really well to them, and they are still her favourites. From various talk boards, I also discovered Wafcol complete food for dogs with sensitive stomachs (we have since swapped to Benevo). It has no meat or animal products in so I bought a bag to see how she got on with it. I started using it mixed in with her meat thus reducing the amount of flesh, a little more of one and less of the other day by day and it was effortless with her, she seemed to respond very well and our vet had no negative comments about it as she is such a healthy happy dog. 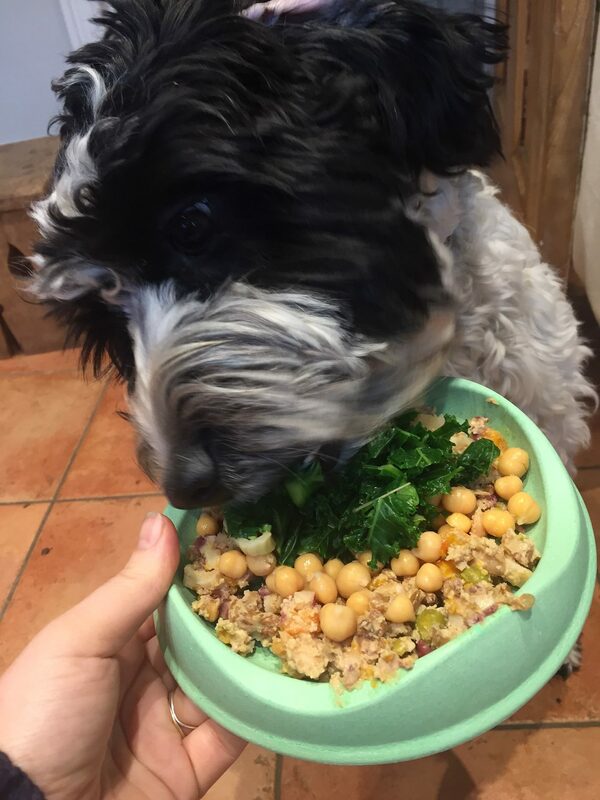 It turns out there are many, many dogs on a meatless and dairy-free diet and if done sensibly like any change can be very good for your dog. I learnt along the way that a lot of condemned meat ends up in dog food, as does fat collected from deep-fat fryers and all sorts of other nasties including all the antibiotics farmed animals are pumped full of. I knew which ever way this was going to turn out commercial meat dog food was not fit for our girl. I was down to about two cans of meat-based wet food a week. This was mixed in with Wafcol and home-cooked vegetables, beans, peas, lentils and things like sweet potatoes, carrots, kale, broccoli and quinoa when I came across Ami wet food. I brought a can from the veggie pets stall at a vegan festival just to see how she liked it and – boom – bowl empty, licked clean and a look of ‘more please’. I ordered a load more and over a week replaced the meat with Ami wet tins mixed in with her other plant-based food. After several months we have a perfectly happy, balanced dog on a plant-based diet who has tons of energy and is thriving as she moves into adulthood. She is the perfect weight and has a thick healthy coat, bright alert eyes, tons of energy as well as the best set of teeth in the house. I’ve been weighing her in at the vets, who are aware of her new diet, and there have not been any issues or concerns at all. 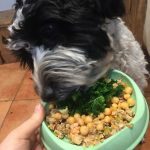 There are many pro and anti opinions of whether feeding dogs plant-based is good or bad – all I can say is that for our dog it works really well and there are thousands of other happy well-cared for dogs out there on a plant-based diet for many reasons. If she hadn’t taken to it, had become withdrawn or had any other negative or concerning changes I would have – if necessary for her health and wellbeing – continued to feed her meat but on a raw meat diet, never canned commercial. Of course she is plant-based rather than vegan as she is not aware of the ethics of farmed animals: if she knew what humans were capable of she’d not be so sweet to everyone she meets, I’m sure. Besides, she will gladly scoff a dropped sausage off the pavement or take a meaty treat from a well-meaning fellow dog walker – so no, not vegan. 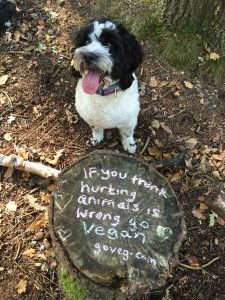 I don’t get het up about this – dogs are scavengers as well as hunters in the wild after all and I am not going to prevent her natural behaviour unless its something like a chicken bone which can splinter and cause harm. 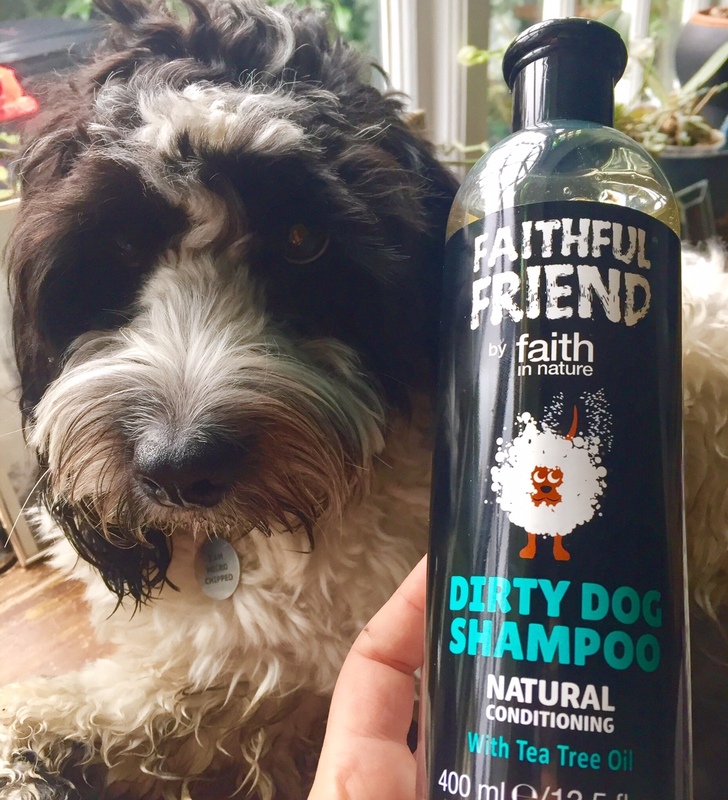 There are other things I have also had to be mindful of when buying things for her that have not harmed others, such as checking if dog shampoos have been tested on laboratory animals, which is shamefully common. 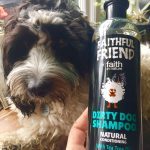 I use Faith in Nature which has a range of different shampoos, all Vegan Society-approved. When replacing collars and leads I check if they have any leather, as I do not think it necessary for her to wear the skin of an abused animal when there are literally thousands upon thousands of other ones to chose from. She has a variety chews, sweet potato knots are her favourite – these and many more are available from Veggiepets. Poo bags, always biodegradable and widely available. Her dog bowl from Beco is made from biodegradable plant fibre plastic -bamboo and rice husks. The one area I have yet to successfully tackle (and any advice would be gratefully received) is a anti-flea and lungworm treatment that is not tested on laboratory animals. We use Advocate and our vet’s receptionist looked into alternatives but without success as of yet. Please email me if you have any recommendations. So there we have it, vegan mum, vegan daughter, plant-based dog and three rescue chickens – all thriving without consuming animal products and with total respect to fellow Earthlings and our environment. 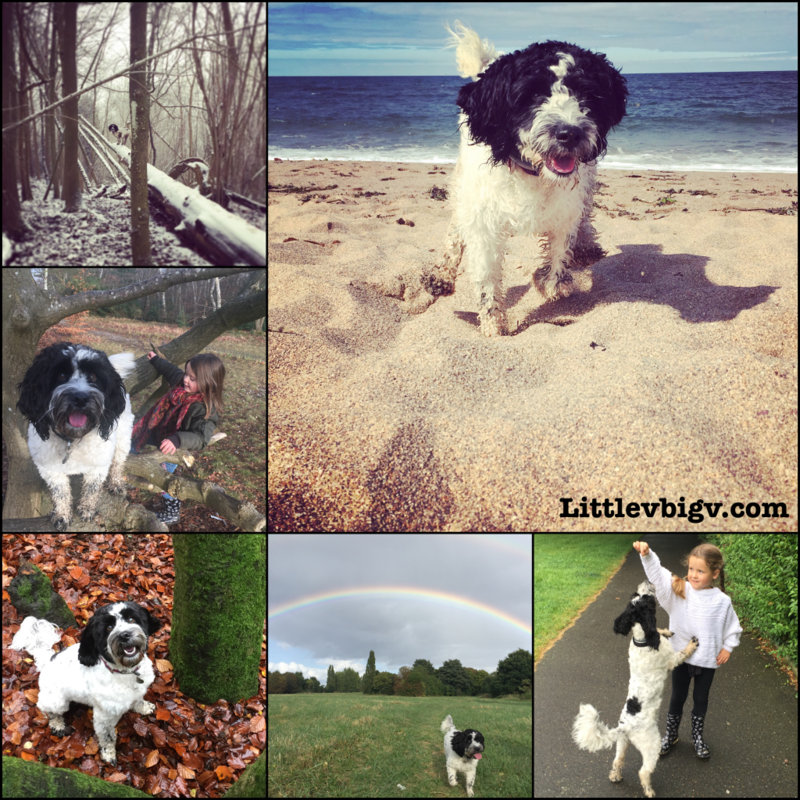 I would love to see photos of any of your plant-based pals please share to twitter or instagram with #littlevbigv so I can find them. Thank you. Very well informed. My 3 pooches have been on a plant based diet for more than half their lives. And they are all loving their homemade food, kibble and treats. There’s so much negativity from vegans about not giving dogs meat but I bet most of them haven’t even bothered to do any research. Love your dog. So cute.